Dr. MacArthur doesn't comment directly concerning this verse. It baffles me as to why any professed gospel preacher would make light of the literal blood of Jesus Christ. Pastor R.B. 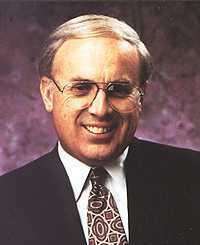 Thieme Jr. in Texas popularized the teaching denying the literal blood of Christ. Perhaps MacArthur learned this heresy from R.B. Thieme Jr., but I do not know. One thing is certain, they BOTH teach the same heresy denying the efficacy (redeeming power) of Jesus' physical blood. Hebrews 9:12 tells us that Jesus entered into the heavenly Holy Place “BY HIS OWN BLOOD.” Yet, MacArthur claims that the Bible does not really mean what it says. Says who? That is just more MacArthurology! On the contrary, the King James Bible states, “Moreover he [Moses] sprinkled with blood both the tabernacle, and all the vessels of the ministry ... For Christ is not entered into the holy places made with hands, which are the figures of the true; but into heaven itself, now to appear in the presence of God for us” (Hebrews 9:21,24). If you'll take the time to carefully read the entire chapter of Hebrews 9, you'll find the word “blood” mentioned 12 times. You'll also learn that the Old Testament tabernacle was a “figure” of the true Tabernacle in Heaven. Just as the Old Testament high priest was required to bring the lamb's literal physical shed BLOOD into the holy place and sprinkle it upon the mercy seat, so did Jesus Christ enter into the heavenly Holy Place with His own literal blood and sprinkle it upon the mercy seat. MacArthur is very wrong! So then why did God require the blood of animals UPON THE MERCY SEAT in the Old Testament? Leviticus 17:11 reads, “For the life of the flesh is in the blood: and I have given it to you upon the altar to make an atonement for your souls: for it is the blood that maketh an atonement for the soul.” Perhaps Mr. MacArthur needs some better reading glasses. There is NO such teaching in the Scriptures! John MacArthur has fabricated his own corrupt way of thinking. Hebrews 9:6-7 state: “Now when these things were thus ordained, the priests went always into the first tabernacle, accomplishing the service of God. But into the second [i.e., the holy of holies] went the high priest alone once every year, NOT WITHOUT BLOOD, which he offered for himself, and for the errors of the people.” How can Mr. MacArthur be so naive and unbiblical as to claim that Jesus' literal physical blood didn't need to be applied to the mercy seat in Heaven, in consideration of such overwhelming Scriptural evidence? While it is true that Jesus' death was absolutely essential to His work of redemption, MacArthur attempts to use this fact in this Scripture as a means of completely disregarding the efficacy (power) of the literal physical blood of Jesus. Hebrews 9:7 isn't talking about the “death” of the sacrificed animal; it is talking about the “blood” of the sacrificed animal. The truth is that Jesus' virgin birth, sinless life, vicarious death, burial and bodily resurrection were all EQUALLY as important as the blood sacrifice itself; but all those things led up to the blood being applied to the Mercy Seat in the heavenly Holy Place. To deny this is to deny the entire Old Testament, all the types, all the blood sacrifices, and the FACT that God would have killed any highpriest who dared enter into the holy of holies WITHOUT BLOOD. John MacArthur's entire “Study Bible” maliciously, but subtly, attacks the precious blood of Jesus Christ. Again 1st Peter 1:18,19 states: “Forasmuch as ye know that ye were not redeemed with corruptible things, as silver and gold, from your vain conversation received by tradition from your fathers; But with the precious blood of Christ...” Now how can Jesus' blood be PRECIOUS if it is only representative of His death? MacArthur continually badmouths the literal blood of Jesus Christ, while simultaneously claiming that he views it as precious of something else it represents. That makes no sense at all. The blood of Jesus is “precious” to the genuine born-again believer because it is LITERAL, having obtained literal redemption for us, washing our sins away just as 1st John 1:7 promised! To no surprise, on page 1964 of MacArthur's Revised and Updated “Study Bible,” in his comments concerning 1st John 1:7, he doesn't even address the blood of Jesus. How could any preacher completely avoid such a precious Scripture which teaches that Jesus' blood washes our sins away? God says that Jesus' blood cleanses and washes our sins away (1st John 1:7). We read in Revelation 7:14, “And I said unto him, Sir, thou knowest. And he said to me, These are they which came out of great tribulation, and have washed their robes, and made them white in the blood of the Lamb.” How does someone like MacArthur just keep explaining all these Scriptures away? What a false prophet! MacArthur is of the Devil. How does a saint wash his robe with death? It makes no sense. Ah, but if you believe the Word of God, i.e., that Jesus' literal blood washes our sins away, then Revelation 7:14 makes perfect sense. Anyone who denies that Jesus Christ is almighty God (i.e., deity) is NOT saved. Anyone who denies Jesus' virgin birth is NOT saved. Anyone who denies Jesus' bodily resurrection is NOT saved. Anyone who denies the sinlessness of Jesus is NOT saved. Anyone who denies that Jesus is the Son of God is NOT saved! MacArthur correctly believes all of these doctrines; but when it comes to the literal blood of Jesus, he falls short utterly. Anyone who denies the redemptive power of Jesus' literal physical blood is NOT saved! These are absolute fundamental doctrines of the Christian faith! These are all part of what the Bible calls, the “DOCTRINE OF CHRIST” (2nd John 1:9)! Many ministers have been deceived by John MacArthur, because he is doctrinally correct in most areas. Unfortunately, MacArthur is WRONG on salvation and the blood of Christ. If a man is wrong on salvation, then he is wrong on everything. MacArthur is a 5 point Calvinist, teaching predestination and limited atonement. This explains his Calvinistic views on Lordship Salvation and the perseverance of the saints in order to be saved. The Bible condemns Calvinism in all its tenets. The Greek word for “unholy” here is koinos and means “common, that is, shared by all.” It means regarding the blood of Jesus as nothing special, common. Although MacArthur states in one breath that Jesus' blood is precious, he deceitfully then states that jesus' blood soaked into the ground at Calvary. MacArthur teaches that it was the “pouring out” of Christ's blood that was precious, and not the physical blood itself. MacArthur teaches that the blood of Jesus is only precious in that it represents the death of Christ on the cross for our sins. That is unbiblical. The Bible calls John MacArthur a liar and false prophet, because the blood had to be applied in Heaven, just as the Old Testament high priest had to apply the lamb's blood once a year to the mercy seat in the earthly tabernacle. The death of the lamb wasn't enough, the blood had to be applied Mr. MacArthur. God wasn't looking for a dead lamb in the backyard; No, rather, God was looking for the APPLIED BLOOD on the doorposts and lintel (doorplate) above the door. The blood had to be applied. John MacArthur's entire ministry is flawed, and he is a false prophet, simply because he is WRONG on the most important Christian doctrine of all—Jesus precious, literal, liquid, blood! No genuinely saved person would ever deny the redemptive power of Jesus' physical blood!